Flat 10% off base fare, Book any international flight from India. Get Rs. 1000 Off Domestic flight bookings with SBI Credit & Debit cards. Rs. 150 Off Your Domestic Flight Booking Or Rs. 1000/500 Off (Round Trip/One Way) On International Flight Booking. Flights Sale! Get up to Rs.1,500 OFF on your domestic flight booking. A minimum booking amount of Rs.20,000 is required for availing the offer. Offer is valid for travel ex-India only. The offer is not valid for Travel agents. Each customer can use the code only twice during the offer period. Offer is valid till 05/31/2018. Get flat Rs 800 Off booking domestic or international flights through PayPal payment. A booking amount of minimum Rs.4,000 is required to avail the offer. This offer is valid for resident of India only. Offer is not available to travel agents. Offer is valid between 05/14/2018 – 05/27/2018. Pilgrimage Stay Offer! Get up to Rs 2999 Off One Night in all the participating destinations Hotels of your Religious trip. Offer is valid till 05/31/2018. Summer Bonanza! Get Flat 50% (max Rs.15,000) off all Domestic Hotels booking for new users.This is valid for users on their first hotel booking only. This offer is valid only for select hotels. This offer cannot be clubbed with any other extended offer. The offer is not applicable where hotel stay has been split into multiple bookings to avail the offer multiple times. Offer is valid till 05/31/2018. Get 25% off + 80% eCashback on Hotels booking in Balasore. Get up to Rs.15,000 off International Flights. A minimum booking amount of Rs.20,000 is required for availing the offer. Offer is valid for travel ex-India only. A customer can avail the offer only two times during the offer period. Offer valid till 05/31/2018. Get up to Rs.15,000 off International Flights. A minimum booking amount of Rs.20,000 is required for availing the offer. Offer is valid for travel ex-India only. A customer can avail the offer only two times during the offer period. Offer valid till 06/29/2018. India Flights on Sale from $799! Fares starting from $799 including taxes for Houston New Delhi. Hurry, Grab your ticket before these deals are gone! Take Flat 25% Off Hotels. Get up to 55% off hotel bookings in Balasore. Rs. 500 Off Domestic Flights With code. Summer special! Get up to 70% off + 10% off using eCash on hotel bookings. Offer is valid till 05/15/2017. Save Rs. 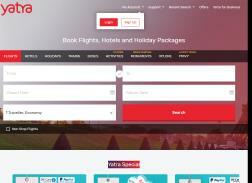 600 on booking 4 or more Domestic flight tickets with code. 10% Off all domestic flights (maximum Rs 700). Some exclusions apply.